Mike Pence Says Trump Never Said That. Well, He Did Republican vice presidential candidate Mike Pence had a number of opportunities in Tuesday night's debate to defend statements made by Donald Trump. He dodged or denied. Republican vice presidential nominee Mike Pence and Democratic vice presidential nominee Tim Kaine debate at Longwood University in Farmville, Va., on Oct. 4. Virginia Sen. Tim Kaine clearly came into last night's vice presidential debate with the goal of making Indiana Gov. Mike Pence answer for Donald Trump's most controversial statements and policy positions. Unlike his running mate the week before, the steely Pence resisted taking the bait. Kaine repeatedly quoted Trump's own words. Pence either ignored him, mocked him, tried a Jedi mind trick reversal or flatly denied the quotes were real. And maybe that was Kaine's real goal. The Clinton campaign is already out with a video. Below, to the best of our ability, is a rundown of the claims Kaine made about Trump, how Pence responded and what Trump really said. These 11 examples are not exhaustive, but they give you a good sense of a dynamic that dominated the debate. KAINE: He built a business career — in the words of one of his campaign staffers — off the backs of the little guy. And as a candidate, he started his campaign with a speech where he called Mexicans rapists and criminals. And he has pursued the discredited and really outrageous lie that the Obama wasn't born in the United States. It is so painful to suggest that we go back to think about these days where an African-American could not be a citizen of United States. And I can't imagine how Gov. Pence can defend the insult-driven selfish me-for-style of Donald Trump. In this case, Pence didn't defend Trump or respond directly, first turning the "insult-driven" line against Kaine before changing the subject. PENCE: Well, let me say first and foremost, that senator, you and Hillary Clinton would know a lot about an insult-driven campaign. It really is remarkable. At a time when literally — in the wake of Hillary Clinton's tenure as secretary of state — where she was the architect of the Obama administration's foreign policy, we see entire portions of the world, particularly the wider Middle East, literally spinning out of control. Trump's current campaign manager, Kellyanne Conway, previously worked for Texas Sen. Ted Cruz's campaign and in that capacity, more than once, said Trump built his business on "the backs of the little guy." For years, Trump was the leading voice questioning where President Obama was born and then questioning the validity of his birth certificate even after Obama released the long-form version. KAINE: You praised — these guys have praised Vladimir Putin as a great leader — How can you defend that? MODERATOR ELAINE QUIJANO: Yes and senator, we will get to that. In the meantime, the question is on running mates. Why the disconnect? PENCE: I must've hit a nerve here because at a time of great challenge in the life of this nation, where we've weakened America's place in the world, stifled America's economy, the campaign of Hillary Clinton and Tim Kaine has been an avalanche of insults. In this case, Pence again didn't respond and accused Kaine of more insults. In fact, Trump has repeatedly praised the Russian president. During an NBC candidate forum, Trump said, "The man has very strong control over a country. Now, it's a very different system and I don't happen to like the system, but certainly in that system, he's been a leader, far more than our president has been a leader." Trump added that he thought he would have a very good relationship with Russia and even accurately quoted polling data out of Russia, saying, "Well, he does have an 82 percent approval rating, according to the different pollsters, who, by the way, some of them are based right here." KAINE: The Trump plan is a different plan, it's a "you're fired" plan. And there's two key elements to it. First, Donald Trump said wages are too high. Both Donald Trump and Mike Pence think we ought to eliminate the federal minimum wage. Pence responded this time by mocking Kaine for repeating a line he has used many times on the campaign trail. He then moved on to criticize the Clinton-Kaine tax proposals. PENCE: Well, first let me say I appreciated [the] "you're hired, you're fired" thing, Senator. You use that a whole lot and I think your running mate uses a lot of pre-done lines. As for Kaine's claim about Trump and Pence's position on the minimum wage, PolitiFact looked into it and deemed it "half true." Trump has held multiple positions on the minimum wage. Pence voted against raising it as a member of Congress but has not said he opposes a federal minimum wage. KAINE: I am interested to hear whether he'll defend his running mate not releasing his taxes and not paying taxes. QUIJANO: Governor, with all due respect, the question was about whether it seems fair to you that Mr. Trump said he brilliantly used the laws to pay as little taxes as possible. PENCE: This is probably the difference between Donald Trump and Hillary Clinton and Sen. Kaine. Hillary Clinton and Sen. Kaine, and God bless you for it, career public servants, that's great. Donald Trump is a businessman. Not a career politician. He actually built a business. Those tax returns that were — came out publicly this week — showed that he [had] some pretty tough times 20 years ago. But like virtually every other business, including The New York Times not too long ago, he used, what he used, what's called net operating loss. We have a tax code, Senator, that actually is designed to encourage entrepreneurship. This is one of the rare instances in the debate where Pence did respond to the criticisms, though he initially didn't speak to why Trump hasn't released his tax returns. So Kaine pressed on, "but why won't he actually release his tax returns?" And Pence dodged, saying, "We're answering the question about the business thing." And Kaine kept pressing: "The last thing I want to ask Gov. Pence is, Gov. Pence had to give his tax returns to show he was qualified to be vice president. Donald Trump must give the American public his tax returns to show that he is qualified to be president. And he is breaking his promise." Finally, Pence said he had to respond: "I'll be very respectful. Look, Donald Trump has filed over 100 pages of financial disclosure which is what the law requires. The American people can review that and he is going, Senator, he is going to release his tax returns when the audit is over." Donald Trump's financial disclosure form is 92 pages long and can be viewed here. But tax experts say it is no substitute for his tax returns. Trump stands alone in recent history for not releasing his returns, which would give insight into his income and charitable giving. PolitiFact rated Trump's claim that the financial disclosure is extensive and you don't learn much from a tax return as false. KAINE: Donald Trump wrote a book and he said Social Security is a Ponzi scheme and privatization would be good for all of us. PENCE: Thanks, Elaine. There they go again. All Donald Trump and I have said is we will meet our obligations to our seniors. That's it. PENCE: We said we're going to meet the obligations of Medicare. That is what this campaign is really about, Senator. And this is the old scare tactic that they roll out. "Trump advocated for raising the age limit to 70 (for those under 40) and for privatization. 'Privatization would be good for all of us,' he wrote, adding, 'On average, personal accounts would have provided a single woman with 58 percent more than Social Security, and wives with 208 percent more. Directing Social Security funds into personal accounts invested in real assets would swell national savings, pumping hundreds of billions of dollars into jobs and the economy. These investments would boost national investment, productivity, wages, and future economic growth.' "
Trump's campaign website doesn't list any detailed information about his plan for Social Security. KAINE: Donald Trump during this campaign has called Mexicans rapists and criminals. He's called women slobs, pigs, dogs, disgusting. I don't like saying that in front of my wife and my mother. He attacked an Indiana-born federal judge and said he is unqualified to hear a federal lawsuit because his parents were Mexican. He went after John McCain, a POW, and said he wasn't a hero because he been captured. He said African-Americans are living in hell and he perpetrated this outrageous and bigoted lie that President Obama is not a U.S. citizen. If you want to have a society where people are respected and respect laws you can't have somebody at the top who demeans everybody that he talks about and again I can't believe that Gov. Pence will defend the insult-driven campaign that Donald Trump has run. PENCE: It is my time, Senator. QUIJANO: It is, in fact, the governor's time. PENCE: I forgive you. He says ours is an insult-driven campaign? Dd you all just hear that? Ours is an insult-driven campaign? To be honest with you, if and if Donald Trump had said all the things you said he said, in the way you said he's said them, he still wouldn't have a fraction of the insults that Hillary Clinton leveled when she said that half of our supporters were a "basket of deplorables." Trump did say those things. On calling Mexican immigrants rapists and criminals, Trump defended his remarks. Trump has, in fact, called individual women slobs, pigs, dogs and disgusting. He uses many of those words in this extended monologue from 2006 about all the reasons he dislikes Rosie O'Donnell. He went after Judge Gonzalo Curiel, who is overseeing the Trump University fraud case, saying he couldn't be impartial because of his Mexican heritage. He did question John McCain's heroism. Trump spoke about African-Americans (and Hispanics) "living in hell" at the first presidential debate. And, as mentioned above, he was a leading voice in the birther movement for years. KAINE: Donald Trump can't start a Twitter war with Miss Universe without shooting himself in the foot. Donald Trump doesn't have a plan. He said, I have a secret plan, and then he said I know more than all the generals about ISIL. And then he said, I want to call the generals to help me figure out a plan and finally, he said, I"m gonna fire all the generals. He doesn't have a plan. But he does have dangerous ideas. Here's four. He trash talks the military. The military is a disaster. John McCain is no hero. The generals need all to be fired and I know more than them. He wants to tear up alliances. NATO is obsolete, and we'll only work together with Israel if they pay big-league. Third, he loves dictators. He's got kind of a personal Mount Rushmore — Vladimir Putin, Kim Jong Il, Muammar Gadhafi and Saddam Hussein. And last, and most dangerously, Donald Trump believes — Donald Trump believes that the world will be safer if more nations have nuclear weapons. He said Saudi Arabia should get them. Japan should get them. Korea should get them. And when he was confronted with this and told, wait a minute, terrorists could get those — proliferation could lead to nuclear war, here's what Donald Trump said, and I quote, go ahead folks, enjoy yourself. I'd love to hear Gov. Pence tell me what's so enjoyable or comical about nuclear war. PENCE: Did you work on that one a long time? 'Cause that had a lot of really creative lines in it. KAINE: Well, I'm going to see if you can defend any of it. PENCE: Look, I can defend, I can make it very clear to the American people. After traveling millions of miles as our secretary of state, after being the architect of the foreign policy of this administration, America is less safe today than it was the day that Barack Obama became president of the United States. It is absolutely inarguable. We've weakened America's place in the world. But rather than actually defend Trump's ISIS plan, Pence moved on to attack Clinton about failing to renegotiate the Status of Forces Agreement with Iraq. In May 2015, Trump did say on Fox News that he has a plan to defeat ISIS, but that he won't tell because he doesn't want the enemy to know that plan. In November 2015 at an Iowa rally, he said, "I know more about ISIS than the generals do." Then during a September 2016 rally in North Carolina, Trump said, "I am also going to convene my top generals and give them a simple instruction: They will have 30 days to submit to the Oval Office a plan for defeating ISIS." The next day, during NBC's commander-in-chief forum, Trump suggested he might fire some of the current generals. Trump has also said the military is a disaster, though more recently he has said it is "depleted." He did say John McCain is not a war hero, saying he prefers people who were not captured. He told The New York Times that NATO countries should pay what they owe in order to stay part of the alliance. The Republican nominee also said in March this year that Israel would need to start paying the U.S. for military aid. Regarding dictators, Trump has praised Putin during the commander-in-chief forum, calling him a better leader than President Obama. He has said he is open to talking with Kim Jong Il and that the Middle East would be more stable if Saddam Hussein and Muammar Gaddafi were still in power. On nuclear weapons, Trump has said "maybe it's not so bad" if Japan had them. He has expressed an unwillingness to "police" the world. At a Wisconsin rally, Trump did say, "Enjoy yourself, folks" at the possibility of nuclear war between North Korea and Japan. KAINE: Alliances are critical. That's why Donald Trump's claim that he wants — that NATO is obsolete and that we need to get rid of NATO is so dangerous. PENCE: That's not his plan. KAINE: Well, he said NATO was obsolete. Trump did say NATO was obsolete. He later changed his position, though PolitiFact deemed his explanation for why to be false. KAINE: Donald Trump again and again has praised Vladimir Putin and is clear that he has business dealings with Russian oligarchs who are very connected to Putin. The Trump campaign management team had to be fired a month or so ago because of those shadowy connections with pro-Putin forces. Gov. Pence made the odd claim — he said inarguably Vladimir Putin is a better leader than President Obama. Vladimir Putin has run his economy into the ground. He persecutes LGBT folks and journalists. If you don't know the difference between dictatorship and leadership, then you got to go back to a fifth grade civics class. Pence did not have the opportunity to respond. Trump has praised Putin as a strong leader, but because Trump has not released his tax returns, there isn't proof on paper that he has business connections in Russia. The Washington Post reports there is strong evidence that Trump businesses have received funding from Russian investors. Trump's former campaign chairman Paul Manafort managed an investment fund for a aluminum magnate in Russia who had close ties to Putin, according to the Post. The New York Times reported that Manafort, who resigned from Trump's campaign, also received under-the-table payments from former Ukrainian pro-Russian president Viktor Yanukovych. Manafort denies those payments, though he doesn't deny doing political consulting work for Yanukovych. Pence did tell CNN that it's "inarguable" that Putin has been a stronger leader than Obama. Kaine implied that Trump's apparent avoidance of paying federal taxes was unpatriotic, and Pence did respond. KAINE: It was a fight to avoid paying taxes so that he would not support the fight against terrorism. He wouldn't support troops. When a guy running for president will not support the troops, not support veterans, not support teachers, that is really important. KAINE: He won't pay taxes. PENCE: Donald Trump has paid all the taxes — do you not take deductions? 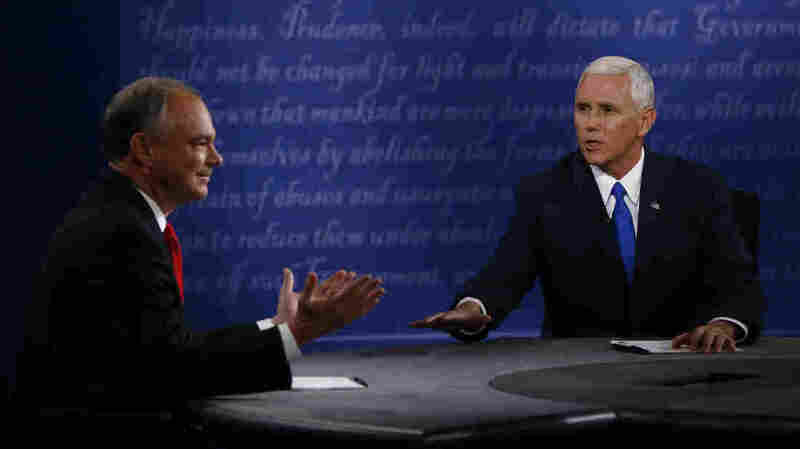 The moderator moved the conversation on, but Pence never did answer whether Trump had gone years without paying federal income taxes or not. Later, Kaine brought up comments Trump has made about nuclear weapons. KAINE: But let me tell you what would really make the Middle East dangerous, Donald Trump's idea that more nations should get nuclear weapons — Saudi Arabia, Japan, South Korea. Ronald Reagan said something really interesting about nuclear proliferation back in the 1980s. He said the problem with nuclear proliferation is that some fool or maniac could trigger a catastrophic event. And I think that's who Gov. Pence's running mate is — exactly who President Reagan warned us about. PENCE: Senator, oh come on, Senator. That was even beneath you and Hillary Clinton. And that, that's pretty low. KAINE: But do you think we should have more nuclear weapons in the world, [that it] will make it safer? KAINE: But can you defend Donald Trump's claim that more nations should get nuclear weapons? PENCE: Let me go back to this Iran thing. Pence tried to change the subject to the Iran nuclear deal, something Pence and Trump have criticized. But the nuclear question came back. PENCE: He never said that, Senator, and you know that. Trump did say it, as NPR's Elise Hu outlined in our fact check last night. "Donald Trump did say at a CNN town hall in March that Japan should have nuclear weapons to deter a threat from North Korea, saying 'the case could be made that let them protect themselves against North Korea. They'd probably wipe them out pretty quick.' He then said it wouldn't be bad if Saudi Arabia and South Korea had them, too. This sent shockwaves through Japan and South Korea, longtime American allies. Japan remains the only country in the world to have nuclear weapons used against it." Eventually the debate turned to abortion, and again Kaine quoted Trump. KAINE: I think you should live your moral values but the last thing, the very last thing, that the government should do is have laws that would punish women who make reproductive choices. And that is the fundamental difference between a Clinton-Kaine ticket and a Trump-Pence ticket that wants to punish women who make that choice. PENCE: It is really not. Donald Trump and I would never support legislation that punished women who made the heartbreaking choice to end a pregnancy. KAINE: Great line from the Gospel of Matthew: From the fullness of the heart, the mouth speaks. When Donald Trump says women should be punished or Mexicans are rapists and criminals, or John McCain is not a hero — he is showing you who he is. PENCE: Senator, you whipped out that Mexican thing again. MATTHEWS: Do you believe in punishment for abortion, yes or no, as a principle? TRUMP: Yes, there has to be some form. NPR's Danielle Kurtzleben wrote about the controversy at the time. Kaine also pushed Pence on Trump's Muslim ban — a policy Trump later revised — and Trump's deportation force and other immigration proposals, which have also recently been softened (the original language on the campaign website has been replaced). PolitiFact looked into the immigration exchange here. About 70 minutes into the debate, Kaine delivered a line that essentially summed up the night, at least from his side of the desk. "Six times tonight, I have said to Gov. Pence, I can't imagine how you can defend your running mate's position on one issue after the next. And in all six cases, he has refused to defend them," Kaine said. Pence accused Kaine of putting words in his mouth. But Kaine got in one more dig. "And yet, he is asking you to vote for somebody that he cannot defend. And I just think that should be underlined," Kaine added. Pence was debating the Clinton-Kaine ticket last night. Kaine was really just there to debate Trump, while Pence had made a calculation that it was better to stay cool and above the fray than to dive into defending his running mate at every turn.